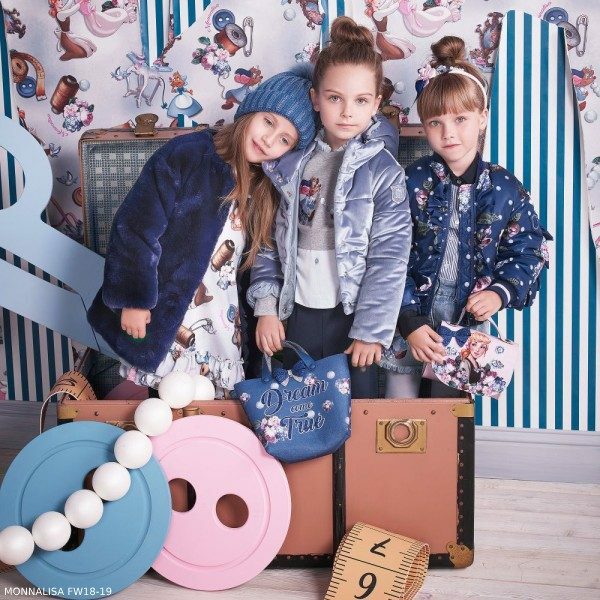 Love this MONNALISAGirls Blue Disney Cinderella Print Dress for Fall Winter 2018-19. She’ll love this soft crêpe dress for girls by Monnalisa with elegant fluted 3/4 length sleeves and a pretty ruffle hem. It has a print of Disney’s Cinderella and fastens on the back with a zip. The dress also has a removable smart blue collar which fastens with diamanté buttons. Complete the look with a Blue Faux Fur Coat and Cinderella soft felt purse. Unfortunately, this MONNALISA Girls Blue Disney Cinderella Print Dress is not currently available. You can shop similar MONNALISA Girls clothes from the current collection online.